In an age where large companies seem to be getting larger and more powerful, being a little guy isn’t very enticing. Unfortunately, there’s often little reason for someone not to go with the name brand. In most instances, the big company has a reputation it has to stand on, plus it has bigger advertising budgets and trust behind it. For example, the entire team of one of our clients was smaller than one of its competitor’s sales teams! It can be disconcerting and disheartening, but I have some good news for you. In a digital age, you can go toe-to-toe with the big guys, and sometimes, you can even come out on top! The first step is to build your reputation with a strong value proposition and testimonials. With competitive strategy, you can carve out your own niche. The second step starts with siphoning away customers and by building your own base. It doesn’t matter if you only have 3 paying customers – you can still build your reputation as a strong business. First, you need a powerful value proposition that differentiates you. Then you need reviews and testimonials. Finally, you need a way to get your current customers to become your salespeople. When your competitors are big, chances are that they can offer just about everything. The trick is to find something that they either aren’t doing or pursue a customer base that has been missed. If they’re offering low prices, develop a premium offering. When their domain is enterprise sales, focus on smaller businesses that have been ignored the whole time. Pursuing the same market is fine too, but make sure that you focus on making your value proposition as strong as possible and know it’s going to be an uphill battle. One easy way to find out your value proposition is to talk with your current customers and learn why they went with you instead of someone else. Do some customer discovery – it helps you develop your brand and also builds stronger relationships with your customers. Spectreresearch uses its Search Engine Optimization strategy to keep all eyes on you. Building a strong reputation of your own is just as important as your value proposition. You might be great, but without reviews, who knows the difference? Did you know that research has indicated that the number of reviews, and not necessarily the quality of reviews, is one of the strongest predictors of sales? Testimonials are a great way to help put the potential purchaser relate to your product. Case Studies help potential customers understand the results of your product or service in a way that pure marketing copy might not be able to. Remember, people are looking at you for a benefit – happy customers indicate that you have something there is a benefit to be gained like a perfectly competitive Strategy. Large competitors generally have a lot of reviews for their products. While you may not be immediately able to match them now, remember that developing a strong business is not a sprint – it is a marathon. Acquiring 2 positive reviews a week for your business might not sound like a lot, but over the course of a year, that’s 104 positive reviews. Reviews for products are pretty easy – ask for them in an email. I don’t recommend paying for reviews since many aggregators such as Amazon and Google actually don’t allow them. If people genuinely like your product, they will be happy to write a review. Testimonials should be straight and to the point to help potential customers see your benefit. Be sure to always get cleared to submit one. If you really want, you could write something up, and ask your potential testimonial if they would sign off on it. Most of the time, the person you want a testimonial from is busy, and as long as what you’ve written is fair, they will probably be fine with it. Case Studies can be tricky, since they’re often more involved, and can reveal a lot about the company that you are going to be doing your case study on. In my experience, I recommend framing any past problems as opportunities. For example, instead of saying “X Company was disorganized and losing money on their Adwords campaign”, you might say, “X Company’s Adword program needed to scale effectively and target keywords with advanced tracking”. If the company is okay with the negatives then do that instead. I will write a post about how to do Case Studies in a later post, but for now, there are a lot of Case Study templates you can find online. You immediately know the next word that will be uttered: DiGiorno. Before Digiorno, frozen pizzas were a niche food product. People purchased it, but most people felt the quality was lacking. Digiorno pioneered a massively successful advertising campaign all built around the concept that its frozen pizzas weren’t just good – they were as good as delivery. Oh, and a hell of a lot cheaper to boot. 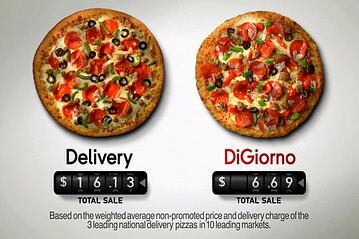 DiGiorno showing that not only is it similar to delivery, it’s also significantly less expensive! Comparison anchors you in the mind of your customers as a product or service similar to your largest competitors. Sometimes, it’s not even competition, it’s aspirational. It doesn’t matter because your potential customers will see you as the same. This is a strategy that can be difficult to execute because you really do need to offer already similar services, but when pulled off, it’s highly effective. Your competitors can’t punch down because then that gives you more brand equity and awareness. They also can’t move as fast, so you have the edge. With this example, your competitor is given a fair shake, but it also looks clear that your solution is best for smaller companies that are looking to scale. And who knows…later on down the line, you might have an enterprise solution too! Also, be sure to have testimonials, case studies, you name it. You want these pages to be strong because they are going to be going up against some tough competition. Thanks to tools like Spyfu, WhatRunsWhere, and SimilarWeb, you can discover sites where your competitor is advertising. If you can afford it, you should also look to advertise on all of these same sites. At the very least, you will have a good idea of what your competitors are up to, and you can start to run advertising that counters them or positions you like a stronger offering. What is branded traffic? It’s the traffic a brand gets from searches related to its brand. A good example is if you google the term “Ticketmaster”, and go to Ticketmaster’s website. I mention this first as a caution: targeting a competitor’s branded traffic on search can be great, but it’s often lower quality, and as a result may cost you more. It may also earn you the ire of the company you are advertising against. If you are prepared to accept the consequences of your actions, then let’s jump right in! When should you target branded traffic? The best way to do it is evaluating how “weak” your competitor is to your comparison. Again, research is key here – if a competitor recently changed their prices, this is a key moment to strike as customers become less happy. Almost any change is a good time to strike. Advertising on branded terms also forces the brand to advertise on their own page, costing them even more. But remember: they can do the same to you! The power of branded advertising: your competitors force your organic result down to the bottom of your page and force them to advertise on their own brand. Not sure you’re ready to take them head on? One alternative is to look for terms like “*Competitor’s name* alternatives” or “reviews” since this indicates customers that are looking to switch. This traffic is often high intent and highly converting. Depending on how big your competitor is, this traffic could even have thousands of searches a month. With some data we can pull, we can see this term has 720 searches per month, and this is just in the US. With long tails, this could easily have more than 3,000 searches a month. You can imagine that this brings in a lot of revenue for advertisers on this page. Of these, the only one I’m really a big fan of is Insightly’s. Salesforce is notoriously difficult to use and they are the only ones that offer an actual differentiator. Getting to the point where you can beat larger competitors takes a lot of time, skill, energy, and a little bit of luck. If you follow this guide of building a strong and compelling value proposition, build your reputation, and market alongside them as an alternative, you have a shot. SPECTRE Research’s Social Media Marketing uses a combination of time-tested copywriting with cutting edge AI optimization to get you the best possible ROI.